I was a fairly unsuccessful tomboy as a child. I got stuck up trees and fell into ponds. I did end up extremely grubby most days though, leading my mother to say if my ears got any dirtier we could grow potatoes in them. My hygiene standards are higher nowadays but I do have courgettes and aubergines coming out of my ears, figuratively speaking. Casting around for different things to do with my Mediterranean veg, I found a fine-looking dressing from Hugh Fearnley-Whittingstall in the Observer the other day and thought it would work well. You can eat this as a meal in itself but it also works well with anything from Middle Eastern-inspired lamb to something as prosaic as sausages. Good-quality sausages though, naturally, not those weird pink dead man’s fingers. Preheat your oven to 400F/200C/Gas Mark 6. Chop the aubergines into bite-sized chunks, put in a sieve over the sink and sprinkle with salt to remove any bitterness. Leave for 30 minutes. I know a lot of aubergines these days aren’t bitter, but having eaten one that was, I prefer not to take the chance. Salting also helps stop the aubergine soaking up so much oil during cooking. De-seed the peppers and halve the courgettes lengthways then cut them the same sized chunks as the aubergines. Peel the red onion and slice into wedges. Halve the tomatoes. 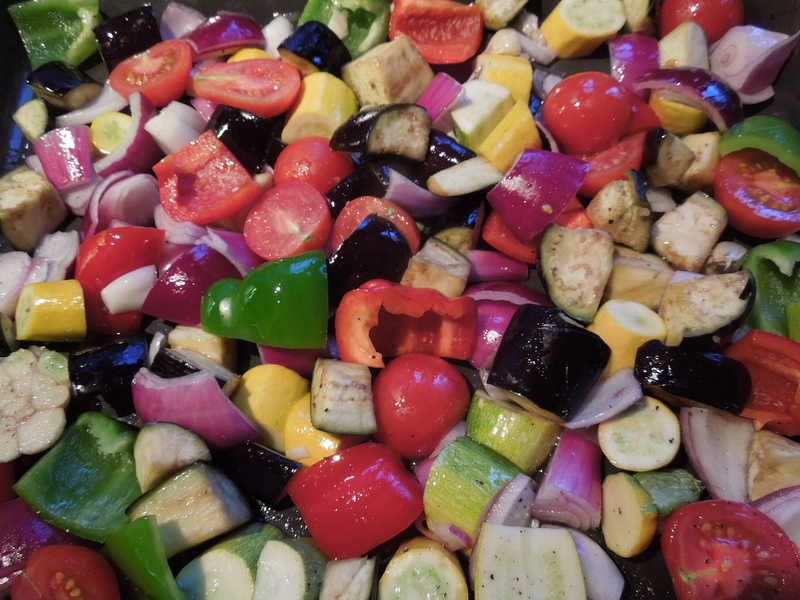 Rinse the aubergines and pat dry on kitchen paper then toss all the veg in a couple of tablespoons of olive oil. Throw in the halved garlic bulb, no need to peel. Season to taste with salt and pepper. Roast for around 50 minutes or until soft and golden. Meanwhile make the dressing. Put the crushed garlic into a small bowl with the tahini, lemon zest and juice, orange juice and a grind of pepper and whisk together. If the dressing goes grainy or thick, just whisk in a little water, one tablespoon at a time, until you get a creamy, trickling consistency. Gently stir in the olive oil and check the seasoning. Drizzle the roasted veg with a little of the dressing and serve the remainder on the side for people to add more if they wish. We ate this with black pepper sausages from Suffolk butcher John Hutton and a herby, cheesey focaccia (unsmoked cheese this time). 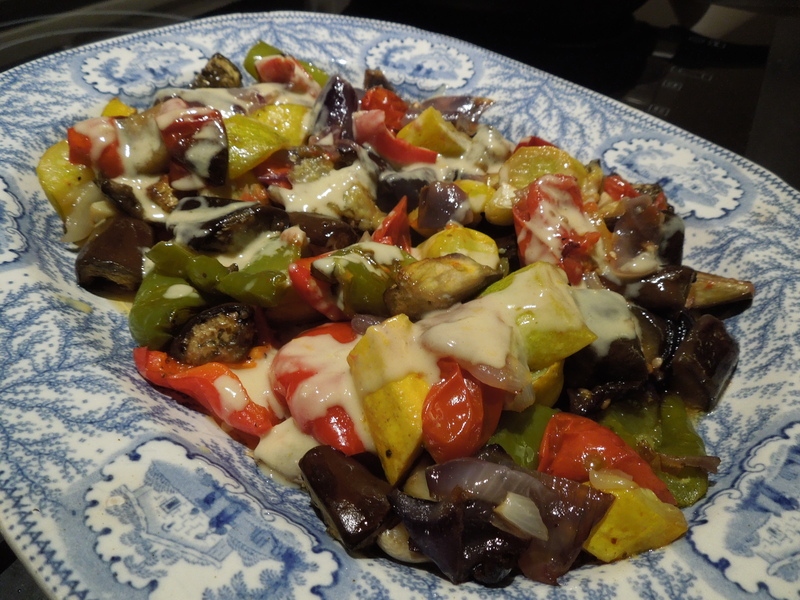 This entry was posted in In the garden, Vegetables and salads, Vegetarian and tagged med veg, roasted mediterranean vegetables, summer salads, tahini dressing by Linda Duffin. Bookmark the permalink. Delicious looking indeed. We found an aubergine that had a hook on one end. I tried it on as an ear ring in the shop, much to the annoyance of youngest daughter. Embarrassing the younger generation is one of the best bits about getting older. 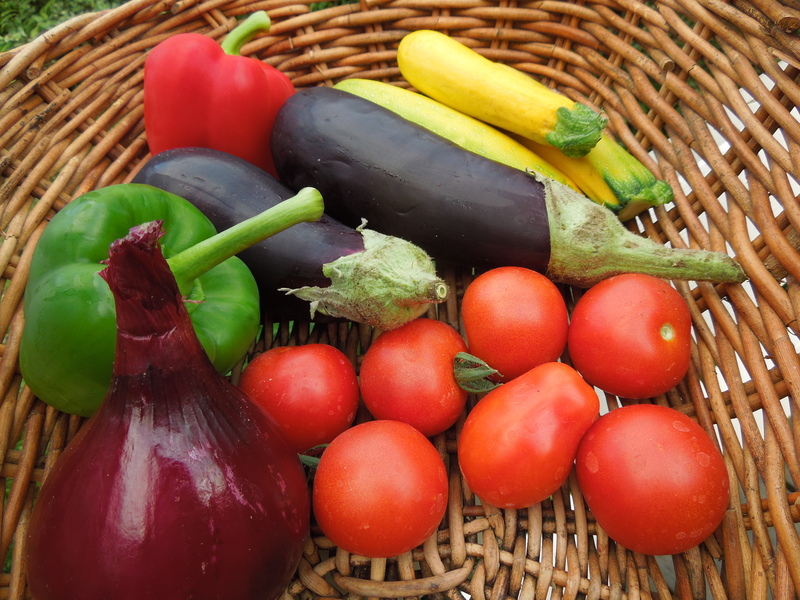 Gather your aubergines while ye may.